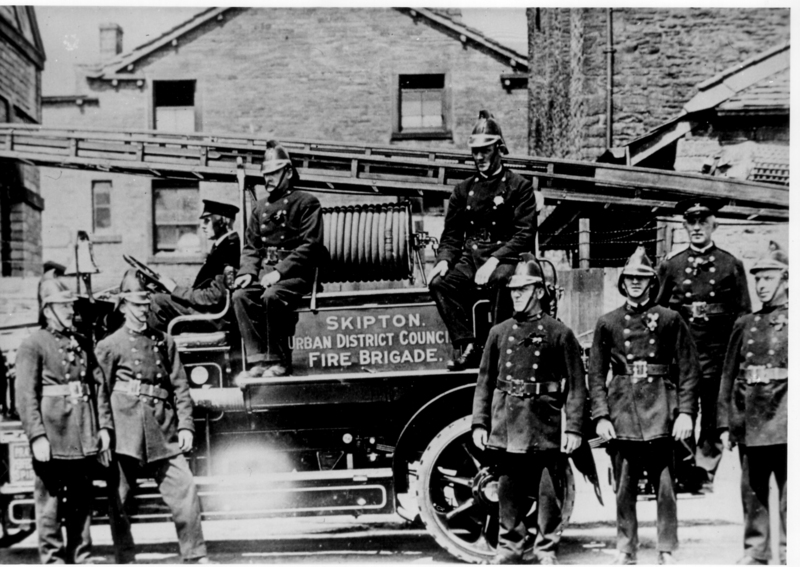 Skipton Urban District Council Fire Brigade, with fire engine, on Lower Commercial Street. Back row, left to right: Bill Robinson (driver), Arthur Hudson, Jack Webster, David Pickles (peaked cap) who worked at Dewhurst's and was in charge of the fire engine. Front row, l-r: Percy Field (? ), Ernest Thornton, Alfred Anderton, Jack Nutter, Billy Friend. Is this the same fire engine as would still have been in use in the 40s? The fire station was in the yard off Bridge St by New Bridge. They were nearly all volunteers. Living on Coach St, as soon as I heard the siren I would go outside to the bridge. Within a minute, men would be heard running along Coach St, down Victoria, Albert and other streets to the station. Then the front seat fireman would ring the bell (like hell) whilst all the others hung on for dear life all standing on the footrest around the engine. No seats, no covers, all exposed to the elements. Though you cannot see the back of the ladder above, it then had two big wheels at the end, presumably for ease of manouvering at the fire site.